"File sync is complicated, but every important," said Wan Jianhua, General Manager of EaseUS Software. "With EaseUS EverySync, you can quickly and conveniently sync files through several clicks, no technical training required. It really makes file sync easy!" NEW YORK CITY, N.Y., Jan. 15, 2015 (SEND2PRESS NEWSWIRE) — EaseUS Software, the leading software developer of data backup and recovery, file migration and storage management, today unveiled its file sync software, EaseUS EverySync 2.0, to provide home and business users a fast, easy and complete solution of file/folder sync. In the era of automation, there is no reason to transfer or backup important files manually. It is necessary to have an affordable utility to keep data safe and up-to-date. 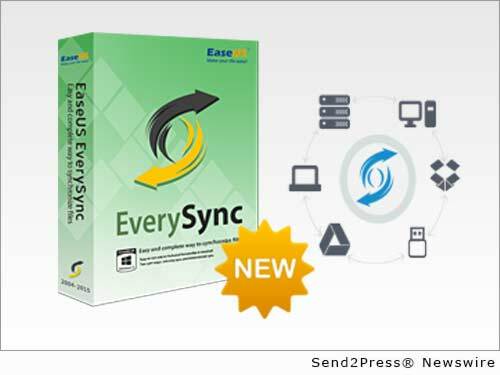 EaseUS EverySync is just the right tool which allows users to sync file between computers, FTP, Google Drive, OneDrive (SkyDrive), Dropbox and network share automatically. EaseUS EverySync offers an easy and complete way to synchronize files with the following benefits. * Complete and secure solution for file sync and backup. * Simple-to-use and intuitive UI makes synchronization simple, no training required. * Automatically sync and backup files in real time if any changes happen. * Two sync ways to meet users’ requirements: one way and bidirectional. * Support Windows 8.1/8/7/Vista/XP and Server 2003/2008/2012. EaseUS wins numerous accolades because its backup software, partition management tool and data recovery software. As usual, its new file sync software attracts extensive attention worldwide, and also get high praise from editors and users. EaseUS EverySync offers file synchronization and cloud synchronization in the easiest way. EaseUS EverySync for $39.95 is available at: http://www.easeus.com/file-sync/. EaseUS provides professional IT solutions for home, education and SMB users, service providers in data recovery, backup, system optimization and partition manager on both Windows and Mac platforms. Founded in 2004, EaseUS has established itself as a fast-growing international company with over 100 million wonderful users in the world. For more information, please visit http://www.easeus.com/. Original Keywords: Wan Jianhua, sync file between computers, FTP, Google Drive, OneDrive SkyDrive, Dropbox, file synchronization and cloud synchronization EaseUS Software New York City New York NEW YORK CITY, N.Y.
REFERENCES: Internet and Websites News, Wan Jianhua, sync file between computers, FTP, Google Drive, OneDrive SkyDrive, Dropbox, file synchronization and cloud synchronization EaseUS Software New York City New York NEW YORK CITY, N.Y.